The Asylum Research Cypher™ AFMs are considered to be in a class of their own. Every design choice was guided to obtain an exceptional combination of highest resolution, integrated environmental control, fast scanning and supreme productivity. 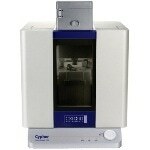 Cypher S is perfect for materials and life science research under ambient conditions in liquid or air. Cypher ES offers heating and cooling, gas and liquid perfusion, and supreme chemical compatibility for all applications that need environmental control. The film has a complex structure after a slow melting and recrystallization process. The original cover image was scanned over a 30 μm area at high pixel density, which then allowed a digital zoom into the 2 μm area shown above. See page 13 for further explanation and a movie of the process. Molybdenum disulfide grown by chemical vapor deposition forms triangular terraces, 2 μm scan Subsequent growth precipitates a new nucleus on a previously grown triangle, thereby forming multilayered pyramids. Image courtesy I. Balla,S. Kim, and M. Hersam, Northwestern University. There’s plenty of room at the bottom. No other AFM will take users further or get them there faster. 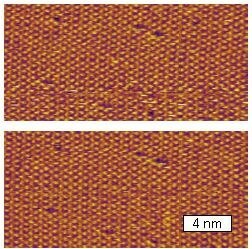 Cypher is not the first AFM to resolve atomic point defects, but it is considered to be the first AFM that makes these results regular. There are no special modes, tricks or luck involved. It is just what Cypher does well. Single atomic point defects are resolved in successive scans. Imaged using frequencymodulated AC mode in water with blueDrive photothermal excitation, rather than conventional tapping mode (AM mode). This AM-FM stiffness image shows lamella spacing of 0.89 nm, consistent with expected polymer chain packing. The larger spacing (lower right) corresponds to steps between stacked lamella terraces. Like FM mode (image far left), conventional amplitude-modulated (AM) or tapping mode can also readily resolve single point defects. Here, the phase data is shown from an image taken using blueDrive in water. Contact mode images in air show the atomic lattice spacing of 0.25 ± 0.01 nm. Image courtesy P. Beton, Univ. Nottingham. See related work in ACS Nano 10, 10347 (2015). One of more than a thousand images collected over 7 h of unattended imaging using lateral force microscopy in air. Image courtesy N. Wilson, Univ. Warwick. See Nanotechnology 24, 255704 (2013). 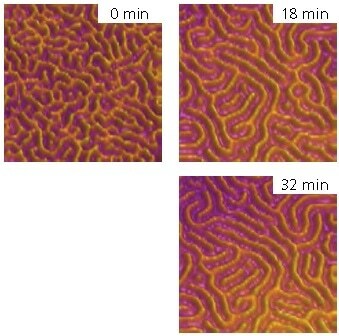 Packing defects in the adsorbed ions were observed in successive images. Imaged using tapping mode in solution with blueDrive. Sample courtesy M. Valtiner, Max Planck Institut fur Eisenforschung. Why Does Cypher Outperform Every Other AFM? 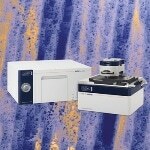 Supreme mechanical stability—Noise floor is half that of any other AFM sold today! Cypher’s mechanical loop is stiff and short, resulting in a noise floor of <15 pm, at least 50% lower than any other AFM. It is the only AFM that regularly attains atomic resolution with no vibration isolation. Cypher has been designed for minimizing thermal drift and is wholly enclosed to rapidly obtain equilibrium. Optional active temperature control can almost entirely banish drift. Ultra-low-noise sensors allow closed-loop scanning even at the highest resolution, eliminating distortion from open-loop piezo creep. Electronic noise sources have been thoroughly identified and eliminated in order to prevent periodic artifacts that could obscure fine details or be confused with real features. C8-BTBT is an organic molecular crystal being investigated for use in organic field effect transistors because of its high charge mobility. Here the molecular structure of an epitaxial film deposited on boron nitride was imaged using tapping mode in air. Sample courtesy X. Wang, Nanjing Univ. See Nat. Commun. 5, 5162 (2014). β -DBDCS is an organic optoelectronic material that exhibits piezochromism. Here, it was imaged in water using tapping mode with blueDrive photothermal excitation. Sample courtesy S. Y. Park, Seoul National Univ., J. Gierschner, IMDEA Nanociencia, and E. Gnecco, Univ. Jena. PTCDI and melamine form a porous 2D network when deposited from solution on a hexagonal boron nitride substrate. Molecular resolution images were obtained in air using contact mode, from which a lattice constant of 3.54 ± 0.04 nm was measured. Image courtesy P. Beton, Univ. Nottingham. TCPP forms a 2D supramolecular network when adsorbed from solution on hexagonal boron nitride. Tapping mode images in air clearly show the square lattice with 2.24 ± 0.05 nm spacing. Image courtesy P. Beton, Univ. Nottingham. 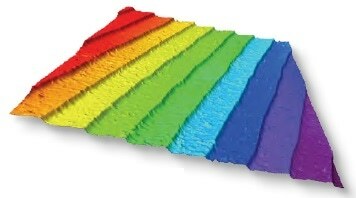 The ordered phase forms spontaneously, with regularly spaced (1.59 nm) rows that exhibit a periodic (0.48 nm) structure. Similar structures have been attributed to adsorbed nitrogen [cf. Appl. Surf. Sci. 304, 56 (2014)], though others suggest they are formed by trace contaminants. Whatever the origin, tapping mode using blueDrive provides exquisite sub-nm molecular resolution. The IL-HOPG interface was imaged using tapping mode in the bulk IL to better understand the electric double layer of this electrolyte as a function of surface potential and ion concentration. Surface exchange of ions and dynamics within the mobile molecules results in some waviness of the lattice rows. Image courtesy R. Atkin, Univ. Newcastle. See ACS Nano 9, 7608 (2015). 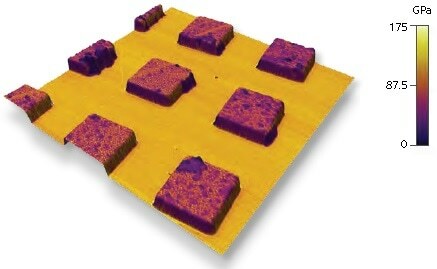 Cypher finishes the whole job faster—with just one AFM and scanner! Cypher AFMs are capable of doing it all — including fast scanning. Cypher scans fast and continues to supports a wide range of accessories and modes. Unlike other AFMs, there will never be a need to switch between different scanners to finish a task. The Cypher small-spot laser module generates a spot of only 3×9 μm — much smaller than most AFMs and well-matched with the fastest probes. Cypher’s high speed electronics and high-bandwidth scanner combine with fast, small probes in order to deliver imaging rates 10–100× faster than typical AFMs. Users can scan an image at 256×256 pixel resolution within just a few seconds, or decrease scan lines and reach frame rates up to two frames per second. Cypher scans fast when obtaining topographic images and it can also scan fast in other modes, including conductive AFM, AM-FM Viscoelastic Mapping Mode, and piezoresponse force microscopy. The experiment does not start when the tip begins scanning. Setup time is also considered. Cypher shortens the whole time from start to finish. Cypher ES allows effortless monitoring of dynamic events that are driven by environmental changes. (5 μm scan size, 192×192 pixels, height images in tapping mode at 20.8 Hz line rate, ~9 s per frame). Crystal terraces 0.9 nm high are observed moving at velocities of about 20 nm/s as the material sublimates, with step edges often becoming pinned at defects in the crystal (e.g., the edge that comes to a point at the defect marked with the green arrow). The edge begins to taper away from this defect in the second image but remains pinned, then pulls away from it in the third image. Many of the defects persist for the duration of the movie. However, in the fourth image we see a defect marked with an orange arrow that finally disappears. The full movie shows the surface evolution over three hours but is played back in one minute. (2 μm scan size, 512×512 pixels, height images in tapping mode at 40 Hz line rate, ~13 s per frame). The surface of a freshly cleaved calcite crystal in humid air reconstructs on a time scale of minutes to hours. The reconstruction is known to be water driven, but there is still speculation about the structure and composition of the film. In addition to demonstrating the ability to capture dynamics, this movie nicely illustrates the exceptionally low Z noise floor of Cypher; the initial calcite steps are only about 300 pm tall. The full movie shows the reconstruction over a period of nearly five hours, played back in about thirty seconds. (3 μm scan size, 256×256 pixels, phase images in PFM mode at 39 Hz line rate, ~6.5 s per frame). The test sample shown in this movie consists of an alternating pattern of oppositely poled stripe domains with a pitch of 10 μm. Just before the second image, a short (~0.5 s), high-voltage (-100 V) pulse was applied to the sample, distorting the domain boundary. An applied bias was then gradually increased, starting at 0 V and ending at 30 V, during which the domain boundary begins to recover to its original state. The full movie shows three sequences of this cycle. 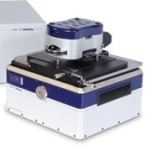 ModeMaster helps you get started quickly with both basic and advanced AFM tasks. Only a few of the many available modes are shown here. Topography imaged using GetStarted in tapping mode, 2 μm scan. Image courtesy of P. Cox, M. Glaz, S. Vorpahl, and D. Ginger, University of Washington. Remarkably simple. Strikingly accurate. Incredibly stable. Tapping is the most commonly used AFM mode as it can measure topography and also electrical, mechanical, and magnetic properties. blueDrive makes use of light (photothermal excitation) instead of a piezo in order to drive the cantilever oscillation. Unlike a tapping piezo, blueDrive directly acts on the cantilever and does not excite any other system resonances. blueDrive tunes are stable, clean and closely match the theoretical response. Automatically tune the cantilever by using blueDrive, even in liquid. There is no guesswork in selecting the correct peak. There is never a “forest of peaks” like what is seen when using piezo drive for tapping in liquid. (Left) Tunes for an AC40 cantilever in water. (Right) Amplitude stability under the same conditions. The driving force employing blueDrive continues to be constant over time, thus the cantilever amplitude remains stable. Image for hours with no setpoint adjustments. The cantilever response is considered to be a rich source of information. With blueDrive, the response matches theory and can be measured, tracked and then modeled with higher precision and accuracy. Rendering showing the detection laser focused near the tip and the blueDrive laser focused near the base. (Inset) Actual optical image showing the laser spot positions on an Olympus AC160 probe. Note the blueDrive spot is very small, so it is compatible with both standard and small, fast-scanning cantilevers. Point defects in adsorbed cesium ions on mica Even after 12 h of continuous unsupervised imaging, the tip was undamaged and resolved atomic point defects. Imaged with tapping mode in 1 M CsCl solution using blueDrive. There is no single best nanomechanical technique for every application. Real-time and offline analysis models can be used for calculating modulus, adhesion and various other properties. Models are completely accessible by users for modification and verification. 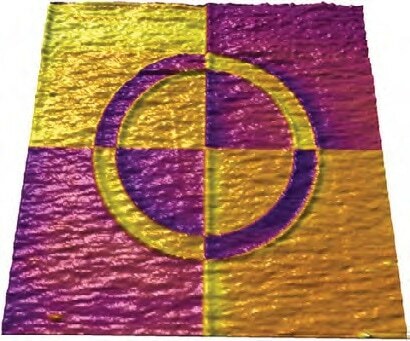 Poly(styrene-(ethylene-ran-butadiene)-styrene) triblock copolymer (SEBS) spin-coated onto a silicon wafer and imaged using AM-FM Viscoelastic Mapping Mode. Elastic modulus is shown on 3D topography, 750 nm scan. Titanium (E’≈110 GPa) thin film on silicon (E’≈160 GPa) imaged using Contact Resonance Viscoelastic Mapping Mode. Elastic modulus is shown on 3D topography, 25 μm scan. Polystyrene-polypropylene polymer blend thin film imaged using Fast Force Mapping mode. 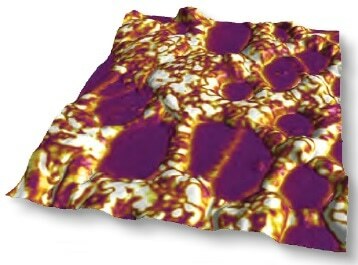 Elastic modulus is shown on 3D topography, 6 μm scan. Doped zinc oxide films are potential photocatalytic materials, because the dopant narrows the band gap enough to allow photoexcitation by visible light. Here, CAFM was used to measure the photocurrent induced by the blueDrive laser, which was aligned just off the end of the cantilever. Current is shown on 3D topography, 5 μm scan. The piezoelectric response of PVDF is widely exploited in tactile sensors. PFM lateral amplitude is shown on 3D topography, 2 μm scan. Sample courtesy D. Guo, Institute of Acoustics, Chinese Academy of Science. The work function of the deposited layers can be tuned by varying the chemistry of an organic SAM that caps the particles. Surface potential is shown on 3D topography, 10 μm scan. See P. Wang et. al, Appl. Phys. Lett. 107, 151601 (2015). Cypher can go where other AFMs cannot go. Present below are just three examples of what Cypher offers that others do not. 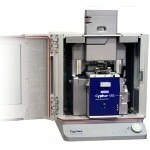 Cypher effortlessly images single atomic point defects, even with glovebox pumps running. The detector adjustment, motorized laser alignment, and engage process are controlled from software. Using Cypher in a glovebox is similar to using it normally. No other AFM can say that. blueDrive photothermal excitation efficiently drives the cantilever oscillation in tapping mode, even in greatly viscous environments like ionic liquids. Only a Cypher with blueDrive allows imaging in liquid to be this simple and stable. The Cypher ES offers matchless chemical compatibility for operating in aggressive liquid and vapor environments. 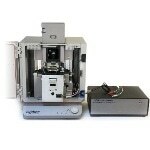 Liquids just touch the sample, the fused silica probe holder window, and a stainless steel or PEEK cantilever clip. 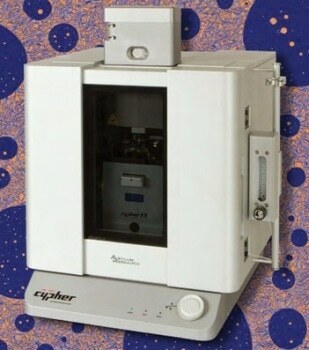 The Cypher ES can carry out experiments that would destroy other AFMs. The pumps were disabled for the top half of the scan, then turned on for the bottom half. There’s no observable effect on the image quality despite the vibration. No extra vibration isolation was used. imaged in a viscous liquid, 5 μm scan blueDrive allowed the cantilever to be driven cleanly in the liquid, while conventional piezoacoustic excitation did not. Toluene rapidly degrades the materials most often used in O-rings and other seals. However, the Cypher ES membrane is made from an advanced fluoropolymer that withstands a wide range of chemicals. Sample size up to 15 mm diameter, 7 mm thick. Samples can be moved for selecting an imaging area employing software controlled stick-slip motion. Engage process Using software controls, the user concentrates on the tip and then on the sample in order to find the estimated separation distance. An automatic motorized process then takes over in order to engage rapidly and without damaging the tip. Standard Laser Module: Modulated laser diode source with nominal 10×30 μm spot size. 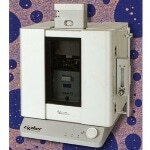 Suggested for most imaging applications. Standard SLD Module: Superluminescent diode (SLD) source with nominal 10×30 μm spot size. Recommended for contact mode and force curves. Laser Diode Small Spot Module: Modulated laser diode source with nominal 3×9 μm spot size. 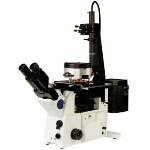 Essential for most imaging applications with small cantilevers. SLD Small Spot Module: Superluminescent Diode source with nominal 3×9 μm spot size. Suggested for contact mode and force curves when employing small cantilevers. Spot positioning and detector adjustment are completely motorized and software controlled. XY Drift <200 nm/°C change in lab temperature. Optional temperature control module decreases this to <20 nm /°C. Illumination Intensity is software controlled. Manual controls for the aperture and field diaphragms. Vibration <10 pm coupling into deflection for 1 mm/s2 floor acceleration when using only the built-in passive isolation. No further isolation is needed for typical laboratories. Acoustic Included enclosure offers 20 dB of isolation. blueDrive photothermal excitation is available on both Cypher ES and Cypher S systems. 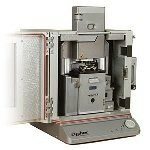 Liquid cantilever holder for Cypher S offers a low-evaporation chamber for measurements in liquid. Environmental control accessories for Cypher ES are available. Note: The company constantly adds new capabilities to its AFMs.